More than 180 papers from the 2018 GRC Transactions Volume 42 are now available online to current GRC members. Don't lose access to these papers - make sure your membership is up to date by renewing your GRC membership today! GRC Membership Renewals have been sent out. If you did not receive your renewal notice, please contact Anh Lay at (530) 758-2360 ext. 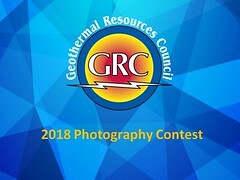 100 or by email at alay@geothermal.org. Don't forget to check out the Policy Committee options and donate to the different GRC funds! We rely heavily on support from generous people like you! All donations are tax deductible. Don't have a renewal form and you want to rejoin or be a new member of the GRC? Download the Membership Application and email, fax, or mail it in! Update your profile and renew your membership online at my.geothermal.org.